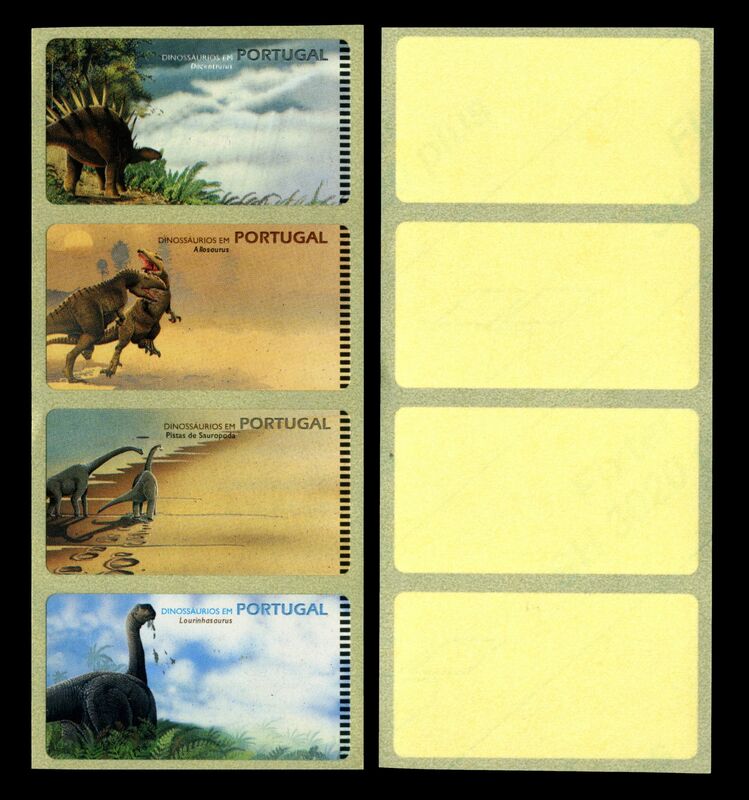 On May 4 of 2015 Post Authority of Portugal introduced 3 new self adhesive ATM stamps. 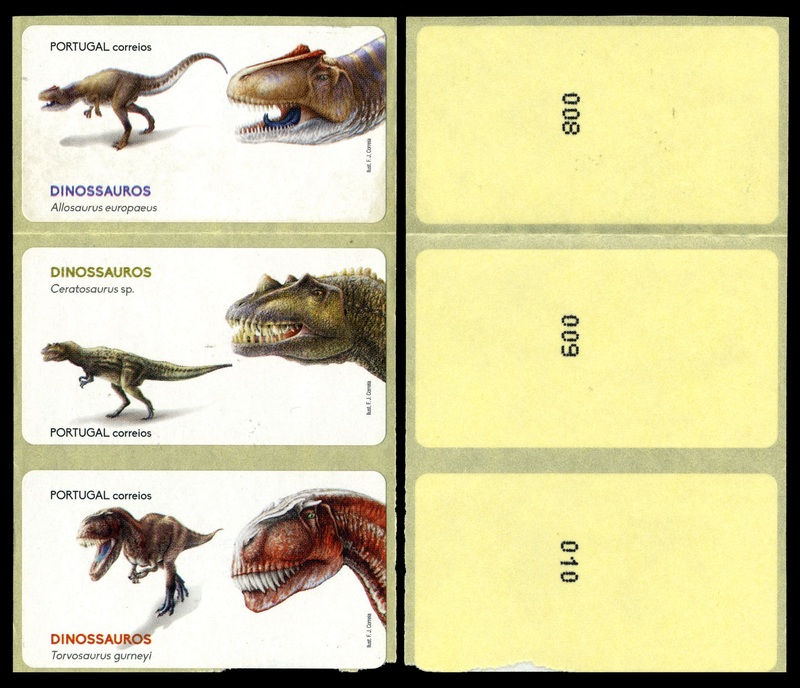 Similar to stamps from 1999-2002 they are sold at Newvision E-Post 2000 stamp machines with predefined values. 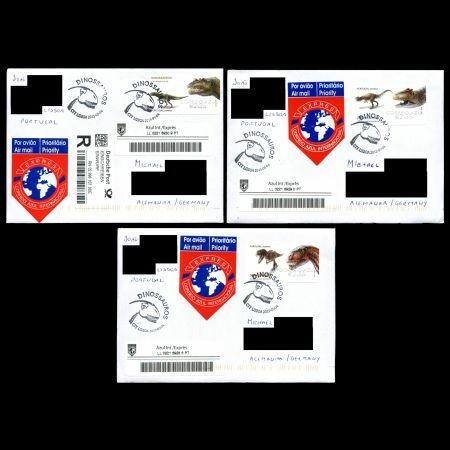 However, it was possible to obtain stamps with other values from the E-Post 2000M stamp machine. 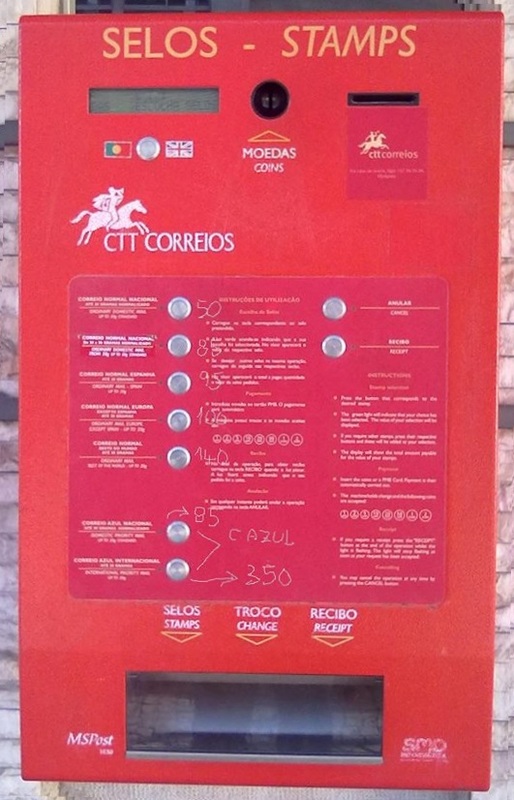 These kiosks are fitted with a scale, and users can buy stamps according to weight, destination, and type of shipping required. An extra postmark designed for 47º Expo National stamp fair in Madrid, which took place only 3 days after the stamps issue, where Portuguese Post was invited for the first time and presented their dinosaur stamps along other philatelic products. 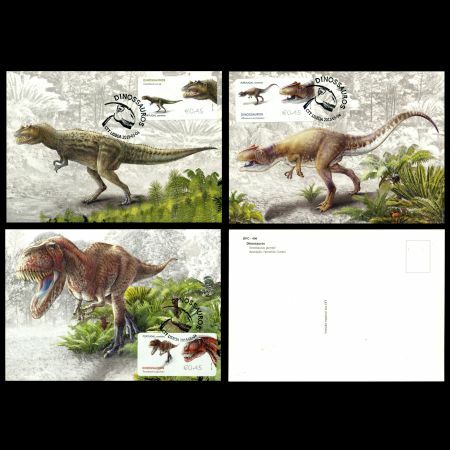 On the first day of the fair Spanish post present their first ever stamps set dedicated to dinosaur. This year, the main theme of the fair was linked to these prehistoric animals, with the intention of attracting the children and young people in addition to those interested in philately The Spanish stamps uses special printing techniques for the stamps (phosphorescence, flaky texture and 3D), but the dinosaurs looks like a cartoon or children drawing. 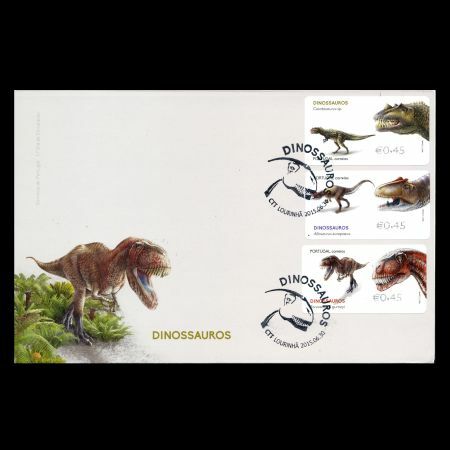 There are three dinosaurs on the stamps:, including Allosaurus europaeus, Torvosaurus gurneyi and Ceratosaurus sp. 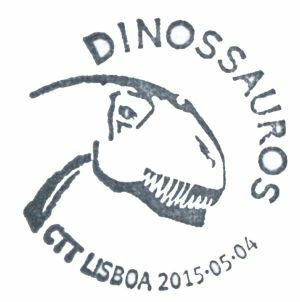 The stamps were illustrated by Fernando Correia who has been one of the paleontological illustration promoters in Portugal and a member of the International Competition Jury of Dinosaur Illustration (IDRC) sponsored by GEAL - Museu da Lourinhã. Torvosaurus gurneyi named in honor of the famous American paleoartist James Gurney – creator of the utopic world of Dinotopia, who also designed dinosaur stamps for USA in 1997 and Australia 2013 Torvosaurus is the largest land predator that lived in Portugal and throughout Europe. His skull average is more than a meter long and a whole would weigh between 4-5 tons and was abiot 10m long. Despite its colossal size, also know it is their embryos, rare findings that can be seen at the Museum of Lourinhã. 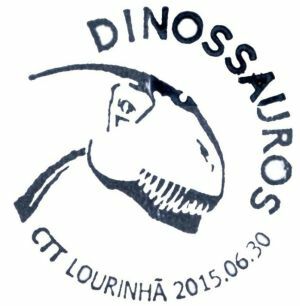 Om March 2014, Sky-News reported about two paleontologists from Portugal who described a new species of giant dinosaur. 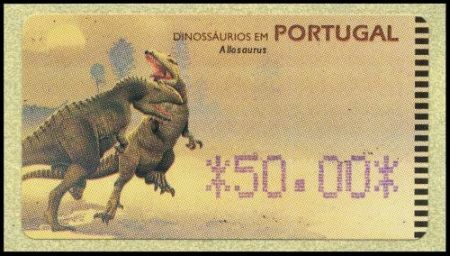 Fossilized bones of this dinosaur were unearthed from the Lourinha Formation near Lisbon, Portugal. 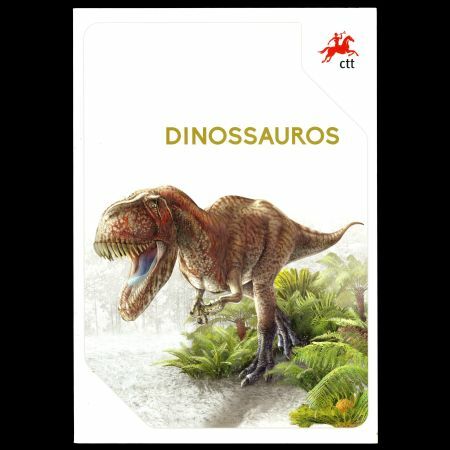 They were originally believed to be Torvosaurus tanneri, a dinosaur species that lived in what is now North America during Jurassic, 153 to 148 million years ago. 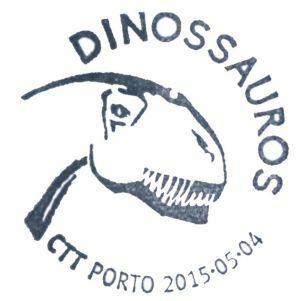 But closer comparison of the shin bone, upper jawbone, teeth, and partial tail vertebrae suggest to the paleontologists that it may be a previously unknown Torvosaurus species. 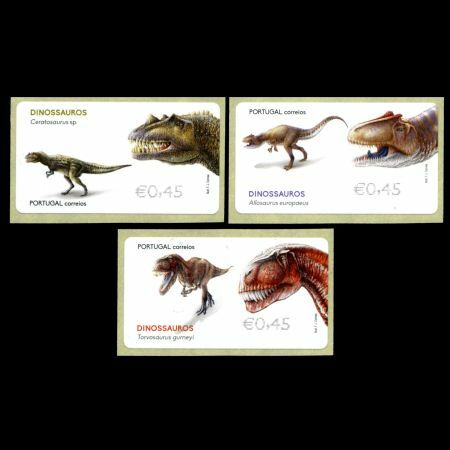 The number of teeth, as well as size and shape of the mouth, may differentiate the European and the American Torvosaurus. 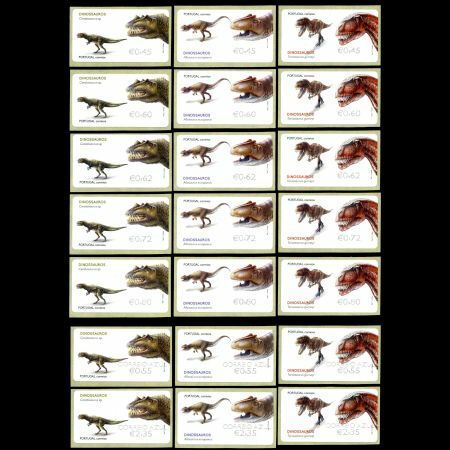 The fossil of the upper jaw of Torvosaurus tanneri has 11 or more teeth, while Torvosaurus gurneyi has fewer than 11, and the mouth bones have a different shape and structure. 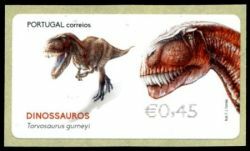 Fossilised remains of other closely related dinosaurs suggest Torvosaurus gurneyi may have been covered with "protofeathers" – the precursors of bird feathers. 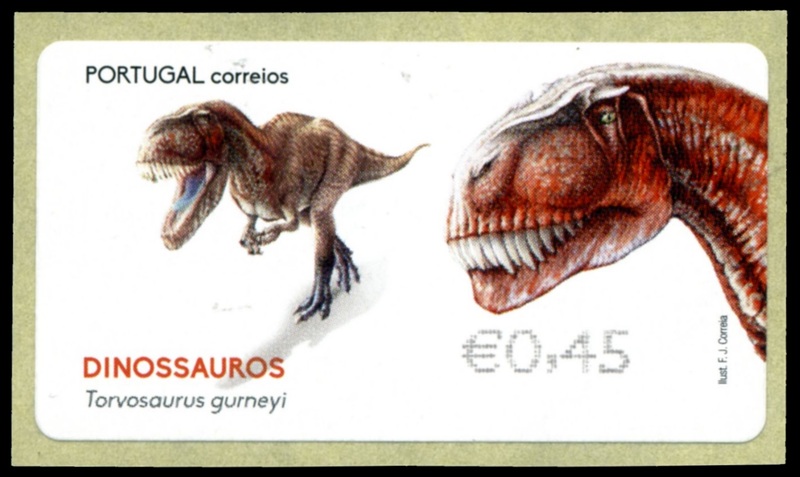 “With a skull of 1.15 m, Torvosaurus gurneyi was however one of the largest terrestrial carnivores at this epoch, and an active predator that hunted other large dinosaurs, as evidenced by blade shape teeth up to 10 cm.” said lead author Dr Christophe Hendrickx from the Universidade Nova de Lisboa and the Museu da Lourinha, Portugal. 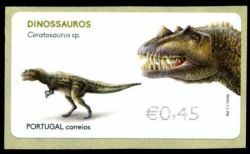 Ceratosaurus , was a large predatory theropod dinosaur, about 5-7 meters long and weighed up to 980 kilograms, from the Late Jurassic Period (about 150 million years ago), found in the Morrison Formation of North America, and the Lourinhã Formation of Portugal. 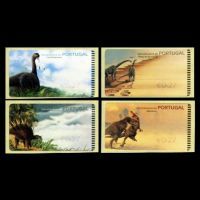 In Portugal, there are no known element of his skull. Still, it is known that the anatomy of various elements of the members are very similar to those known in North America. It was characterized by large jaws with blade-like teeth, a large, blade-like horn on the snout and a pair of hornlets over the eyes. 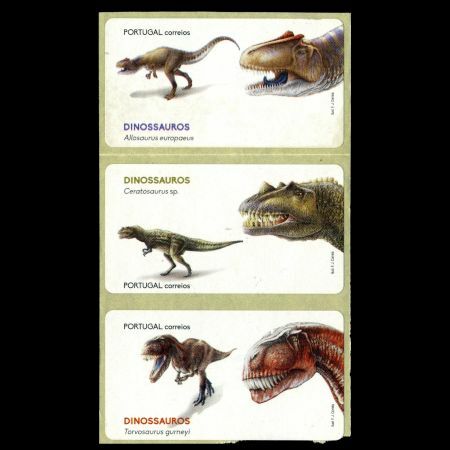 The forelimbs were powerfully built but very short. A row of small armors was present down the middle of the back. 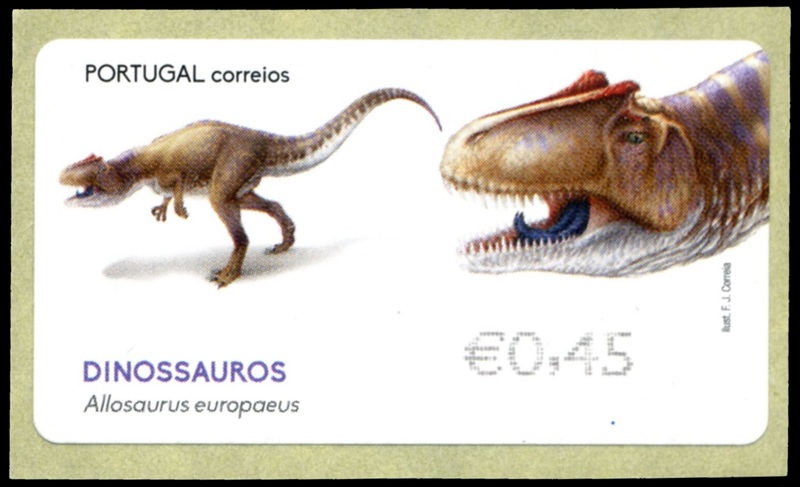 Finally, one of the great predators best known in Portugal: the Allosaurus (appeared on stamps from 1999-2002 too). It is known the skull, teeth, vertebrae and many other elements of its skeleton. 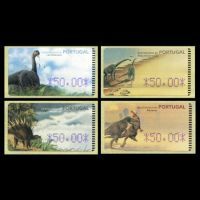 Its also lived in North America, however, there are some differences between American and the Portuguese species who have been justified by some experts. 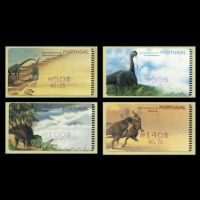 Similar ATM stamps: Portugal 1999-2002 "Dinosaurs of Portugal"